On Tuesday, Japanese distiller Suntory Liquors will release a limited edition of its blended whisky, “Rolling Stones 50th Anniversary Whisky,” as part of the Stones Bar series. The limited-edition run is limited to 150 bottles. 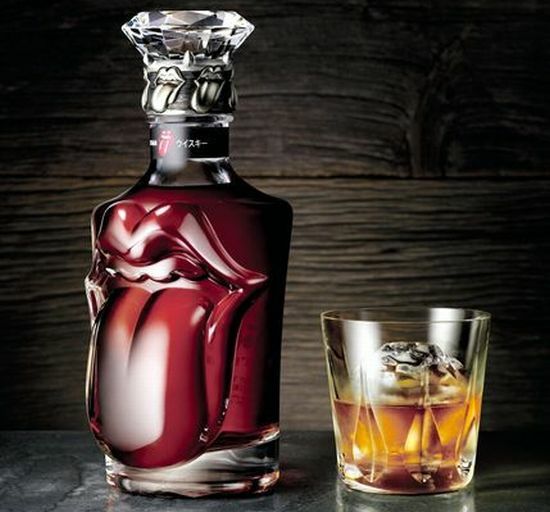 The Rolling Stones 50th Anniversary Whisky is bottled in a crystal bottle designed around the band’s iconic lips and tongue logo. The bottle features the logo cut in relief on the front of the bottle, and a diamond-shaped decorative stopper. The bottle comes in a stylish box modeled after a black sofa. Last week, the Stones played a surprise club show in Paris, the first in a series of expected warm-up dates before the band performs 50th Anniversary concerts at London’s O2 Arena on November 25 and 29, and then the Prudential Center in Newark, NJ on December 13 and 15. On November 12, the Stones will release “GRRR!”, a new greatest hits collection to mark the band’s 50th. Learn more about “GRRR!” here.